What is a Certified Nurse’s Aide? Becoming a Certified Nurse’s Aide (CNA) is one of fastest routes to starting your career in healthcare. Our Nurse’s Aide Program can take as few as four weeks to complete. Students learn the 25 traditional nursing aide skills and additional pertinent clinical competencies. Graduates of the program are eligible to sit for the State of Connecticut’s CNA certification exam on campus. CNA’s often work alongside RN’s and LPN’s, performing essential hands-on care for patients in a variety of healthcare facilities. What CNA job opportunities are there for graduates? Why choose the Nurse’s Aide Program through Stone Academy? Stone Academy’s Nurse’s Aide course trains students in the required 25 traditional nursing aide skills and additional pertinent clinical competencies necessary to sit for the State of Connecticut CNA certification exam. The 125-hour program includes on- and off-site clinical training that introduces students to specialized healthcare and prepares them for employment in nursing homes, long-term care facilities, hospitals, home health, sub-acute rehabilitation, hospice and other health care facilities. 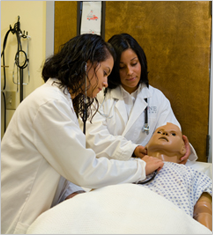 Prior to graduation, all students are given the opportunity to practice clinical skills in an active medical facility. Clinical rotations are required by the State of Connecticut prior to taking the CNA certification exam. The clinical experience allows students a hands-on opportunity to demonstrate their nursing aide skills that will be used going forward in their career. Program schedules are flexible: Day, Evening, and Weekend classes are offered and programs run for 4-16 weeks.